Ananka's Diary: Can Animals Predict Earthquakes? It makes since. Animals aren't focused on petty matters as we humans are. They are built for survival and pay more attention to their surroundings than we do. Also smaller animals are more likely to notice small tremors or changes as they are more perceptible to movement. Also we wear layers of protection against the enviorment and build structures that animals don't. Sorry this is really long and complicated,I just find this topic so interesting and undiscovered. 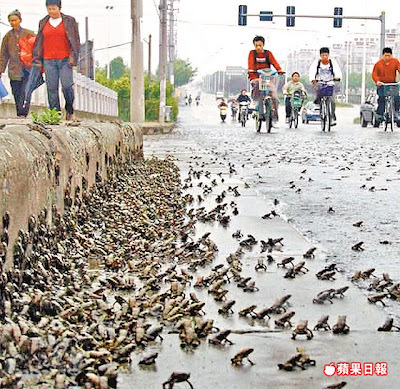 Oh yeah, I read an article about superstitious Chinese bloggers complaining about how the government is wasting money on scientists when all they have to do is "breed toads." xD But scientists have been saying that it's the normal migration time (or whatever) for toads. By the way, why don't any of the Irregulars have siblings or pets? I mean, Luz has sisters but they don't come into the story much...or will they? Didn't you have two crazy siblings? Haha. I've also heard that animals can predict tsunamis. If other living things get these super powers, why can't humans??? its kinda odd that only behavior like this has been noticed in China and Japan, or has it been noticed everywhere??? well skyla, its probably because we humans are so up ourselves that we have replaced all our instincts and potential 'super powers' with bits of technology to do the job for us (we're so lazyyy). with these bits of metal doing everything for us,we dont need wickid super instincts, and so with the theory of evolution, our powers phase out, blah blah blah. and dangit, because how cool would it be to have superpowers, even something lke detecting tsunamis. totally awesome! i have a sibling, well actually, i have three, if you include my two deliciously cute chickens. they are too cute! I love chickens, just like Howard van Dyke. Hmm. The thing is, maybe we CAN, anonymous! Maybe humans have just been to ignorant to realize that the whole, 'My bones tell me there will be RAIN', is more than a wierd saying. Who knows? Were there toads at Myanmar? Oh my gosh, pandas ARE cute. 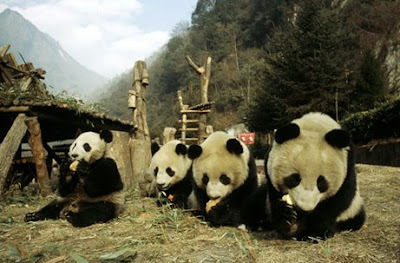 They're my favorite animals, and to this day I don't know why I'm not Invisible Panda. On the subject of earthquakes: Whenever my dog goes crazy I get paranoid. Is the wind stronger than normal? Is that THUNDER in the distance? Jin Ai: Yeah, I guess there's some controversy about the toads. Some say they were migrating, some say the government is lying. Who knows. As for siblings or pets, after many harrowing childhood experiences, I figured it was best to leave such things out of my books. ha. Kiel: No, it's not just in Asia. I've heard lots of stories about dogs and cats "predicting" earthquakes in California, too. Anonymous: Iris. Must get on that pronto. IM: I haven't seen any info about Myanmar. But I did read lots of articles a few years back about animals fleeing for the hills in the minutes/hours before the tsunami hit Thailand. I read about that awhile ago, there had been a lot more proof then just the China Earthquake. And I agree with girlskickbutt!!! Anaka, where did you find that pic! It's so interesting! That's what my mom told me after the huge earthquake that just happened in China. "Remember: If any animals start acting crazy, start packing." And I also remember that you said somewhere in Empress's Tomb about this. We were studying sound recently in science, and my teacher was talking about this sort of thing. She thinks that the earth emits infrasonic noises the only animals can hear. Raph there is no such thing as coincidences. the only thing there is, is hitsuzen! I have heard that the same thing happend before the tsunami. The animals probably have some sort of second sight!! Ananka... are the pandas OK? I hope so... you can tell I like pandas by my username. And, here's news for you. My friend, Callie got the Kiki Strike Book and she said she loved it!! I read something about this coal miner guy: he was throwing bits of coal at a rat just to annoy it, and his dad made him stop because it's mean and sometimes animals know things people don't, and then the rat grabbed all her babies and ran out of that part of the mine, so the guy and his dad scrammed too, and like ten seconds later the whole cave they'd been in fell in!!! But people CAN do things like that too: there was this girl who'd been studying tsunamis in school, and she saw all these tsunami-is-coming signs and told the life guard who made everybody get off the beach, and like five minutes later this monster wave came and swept away all the beach umbrellas, but nobody was hurt. Sorry for the long post which I think was three loooooong sentences including this one! I mean, did they make it in the earthquake in China?? of course they know! it's animal insticnt. how do you spell that? but when a tornado almost (well it kinda did)hit my town, (i was out of town on a school trip) my mom said my cat was all freakin out beforehand. About the tsunamis, Hazel-- Not to sound like a know-it-all (which happens to me a lot), but it's really not that difficult to tell when a tsunami is coming in. If the water withdraws from the beach rapidly, like the tide is going out way too quickly, then you should leave. Immediately. And get to higher ground.